PDF Reader App Review: Store and Easily Read Your Entire PDF Library on Your Mobile Device | West Loh on Leverage, Automation and Outsourcing Strategies, 100% Free! And welcome to the PDF Reader app review. This is West and thank you for joining me on this exciting app review. Now this app I absolutely love. And the reason I do is because it enables me to read not only PDF, but also Word, Excel and other documents on my iPhone in an optimized way. Now it has a whole heap of other features but I love the fact that I’m able to put my entire PDF library onto my mobile device and read it whenever I want in a way that I want, bookmark it whenever I want and just consume it however, whenever I’m on a plane or a train. It just has a whole heap of features that makes it really easy and it’s got some surprise features which I’m going to talk you through. So this is the screen that comes up with when you first open it. Obviously, I put some PDFs that I’ve either purchased or got from my own hard drives. What you’ll notice is that it tells you how big the PDF is and it tells you the title of the PDF. This tab here , the SETTINGS tab, if I tap on that, what it allows me to do is this feature called JUMPSPACE, when you’re reading a PDF, instead of scrolling or autoscrolling, this particular feature jumps every however many pixels you want it to jump. So you just need to choose that. The TIME INTERVAL, it gives you an amount of time it that takes before it jumps. So I’m going to show you how that works a little bit later on. And the rest of the features are pretty self‑explanatory down here so I’m going to go ahead and tap up here. This picture of a computer down the bottom left allows me to share my documents by wi‑fi so I can download all the PDFs on my iPhone to my computer and if I have any documents on my computer, I can put them on my iPhone via wi‑fi. And all I need to do is tap on that. It’ll give me an address to type it into a browser and it enables me to transfer data either way. So that’s a great feature that makes this app easy to use. I’ve tried some other PDF ones and they have some really funny ways to get your PDF onto your iPhone but that’s the quickest and easiest one. Now this tab , the CAMERA, allows you to actually create PDF documents. And if I tap on SCAN PAGE, obviously, I need to take photos with my camera, scans with my camera or if I’ve already done that, I click on PHOTO LIBRARY and it now allows me to create a PDF from there. A really cool thing I did the other day was I wanted to just take an inventory snapshot of my iPhone. So I basically scanned, I pressed the home page and the on and off button, taken a photo of the screen, took screenshots of all of the apps on my iPhone. It took me probably about twenty seconds to scroll through, take photos. Once I did SCAN PAGE, they all came up here. I clicked MAKE PDF and it turned it into a PDF document. I emailed it to myself and it was done in less than two minutes flat! And just from time to time, I like to see what apps that I have and look back over time and see what apps that I’ve had on my iPhone. So that’s just one really cool way of using this feature of this app. This tab here of a FOLDER allows you to create folders and organize your PDFs into folders. And the information just tells you how to use the app. It gives you a manual. 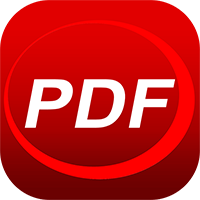 So let me take you really quickly through how to read a PDF. Obviously, you tap on the PDF and it’ll open it up for you. Now there’s a few different options in reading it. Obviously here, ZOOM IN and ZOOM OUT, if you want it bigger or smaller. You can use this to navigate what page you like to go to. Okay, so this tab down the bottom right here if you go ahead and tap that , gives you a few different options. Remember before we spoke about the flow of the text, whether it allows you to skip a certain amount of flow, how many pixels and how fast? So if I tap that , what actually happens is this book just starts reading automatically, which is pretty impressive. This option allow you to lock it in place so that when you move it, it doesn’t sort of go out of the focus of the screen. I mean they’re pretty much the basic options which I use. I don’t really use the other options. So when I scroll my finger up and just hold down and drag—this is how cool this app is—it just allows you to read the app at your own pace. If I put two fingers on and increase the width of my fingers, it allows me to obviously have a larger view. And notice how it’s going left or right as I sort of move my fingers there. If I want to lock it in place, then I’ll lock that and it just kind of goes straight up and it can’t move left or right, which is a great option. Now the other thing is, if you want to obviously flip it, you just unlock it really quickly and I’ll resize it. So obviously, if you want to read it from the side, it’s much, much more readable if you’re that so inclined. But it’s obviously still very readable from this position as well. So this tab down the bottom left allows me to bookmark the actual page that I’m on. And later on—let’s say I bookmark that—later on I can view my bookmarks. I’ve just bookmarked page 5 and there it is. It’s got also the outline of the book and the thumbnails of all the pages if you want to jump there really quickly. Again, really cool for this type of app. And that’s pretty much it. So that’s a really quick tour of the app, how to use it, how to read. I basically use it to read. I put my favorite ebooks on there and in my idle time, when I’m able to read, I just chuck it on there and let it autoscroll and it just takes it through there real quick. I’m able to scan and stop and bookmark where I need to. Any notes that I’ve taken previously and converted to PDF or newsletters that I’ve downloaded in PDF or any other Word, Excel documents, including images and audios and videos, I believe you can actually store on here as well and consume it at your own pace. So yeah, it’s just a versatile app and I was really impressed by the fact that you can put your entire library obviously up to the amount of space that your iPhone or mobile device has on it that you can store documents. So that’s a lot of documents if you’ve got a 64GB or a 32GB device, which is super, super impressive. And that’s a lot of reading! More reading than you could ever do in one lifetime. So choose them wisely. Just some different thoughts on this app. I like to give some different commentary also. I feel that it’s still a bit buggy from time to time, like it’ll crash on certain documents. So some documents it might be able to read, a very small percentage, however. And some formats I find it’s a little bit buggy with. And if you have an iPad, this app would just be insane with an iPad. I think it would be very, very impressive and would make me want to actually do a lot more reading than I actually do. But overall as a PDF reader, it is hard to beat. And I give it an 88% out of 100% because of its amazing capabilities to store and easily access and easily read ebooks. So thanks for listening. I hope you enjoyed it and good luck with your PDF reading.